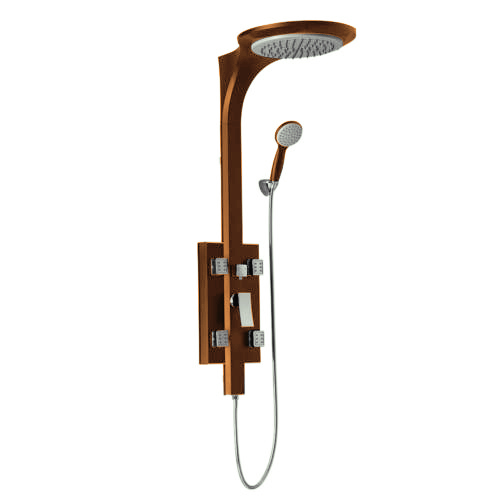 The Genoa Shower Panel System is a Oil Rubbed Bronze Shower Panel that comes with a variety of features like Rainfall Shower Head, Body Shower Jets & a Handshower. The Genoa Shower Panel System is made of Tempered Glass	& is wall mounted which comes with all the accessories requires for installation. 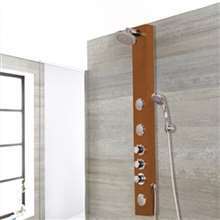 The shower panel doesn't look like any other shower panel I've seen before which is why I was interested in it. The finish also looks nice, which is another reason why I wanted to buy this. It didn't take me long to decide to buy this, and I think one reason for that is the sale price. Anyhow, this shower panel works well and I have seen no trouble with it since it was installed. Your web page states all orders shipped UPS or FedEx see att, this order has been a nightmare from start to finish, the 1st shipment arrived with most of it un useable due to incorrect parts sent, i sent numerous emails to you including my cell# that went unanswered see att, and finally called to get information, yesterday, when I spoke with JohnnyÃ¢â‚¬â„¢s supervisor I expressed my self very clearly that I need the replacement parts sent overnight as I had plumbers and tile work on hold due to your error, last night I received the tracking info from USPS that is not over night and again US mail not UPS or FedEx as advertised, if this is the way you treat customers then I am going to take every avenue open to me to express my anger and voice my feelings very Cleary about the lies on your web site regarding shipping and your total lack of customer support, I will NEVER get another thing from you as long as I live and my reviews will express just that on twitter, Facebook, your web site. There are so many things that I love about this shower panel. For one, there's the look. I really find this shower panel very beautiful. I actually think that it has helped improved the aesthetics of my bathroom. 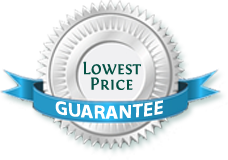 Then there are the product features, which I am totally amazed with. I've never had a shower panel before so I'm thoroughly enjoying this one. Then there's the sale price, which is something to be really thankful for. Otherwise, I may not have been able to buy this. When I first saw this, it reminded me of that sci-fi movie, you know, the space ship... Enterprise is it? Anyway, except for the color, this reminded of that ship, and though not a fan of the movie, I bought this one because I liked how it looks and because I've always wanted a shower panel. Well, three weeks down the road and this shower panel's been working perfectly. Two thumbs up!